In addition to the fingerprint scanner, there is another new hardware component in iPhone 5S that security-minded folks might get excited about. 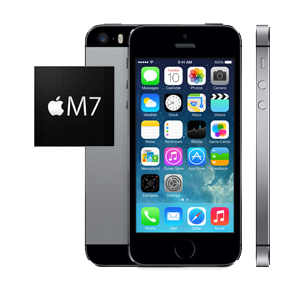 I’m referring to the M7 motion coprocessor. According to Apple, the chip continuously measures motion data “from the accelerometer, gyroscope and compass to offload work” from the main processor. Here’s why this is interesting. Continuous user authentication could occur transparently by spotting anomalies in which the user interacts with the system. Such methods could avoid interrupting the user unless the system begins to doubt the person’s identity. An app utilizing M7 could help Identify the unique walking pattern of the phone’s user. This authentication approach is described in a paper titled Pace Independent Human Identification Using Cell Phone Accelerometer Dynamics. Perhaps without M7, this methodology would have been impractical due to the battery drain and the lack of accurate measurements. Another example of an authentication approach that could make use of the phone’s motion sensors is exhibited by SilentSense, which tracks “the unique patterns of pressure, duration and fingertip size and position” exhibited by the phone’s user. The goal of this technology is to spot when the phone is being used by an unexpected person. While Apple isn’t planning to grant app developers access to the fingerprint reader (a.k.a. “Touch ID sensor”) according to AllThingsD, access to M7 will be available using the expanded Core Motion API. This would allow third-party developers to come up with innovative ways of utilizing M7 motion coprocessor capabilities that go beyond fitness-related applications, assuming Apple’s App Store guidelines will allow this. Who knows, perhaps your favorite phone security app might soon issue an alert if it detects that an impostor is carrying your phone, giving you an opportunity to wipe the device or take other corrective action. Just an idea.